Gluten Free Gingerbread Granola takes just a few minutes to mix up, has only 9 ingredient and is perfectly spicy and sweet! 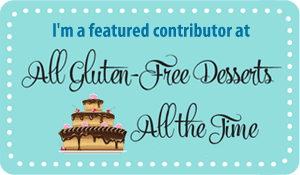 If you are a granola fan, you are in for a special treat! When I was growing up my family almost always had a canister full of homemade granola. Our recipe was simple and we made it exactly the same way every time. Oats, honey, oil, molasses, coconut, sunflower seeds, water, and wheat germ. I remember measuring the ingredients with my mom. We’d mix them all together in our biggest metal mixing bowl, and then we would bake the granola for several hours IN our mixing bowl, stopping to give it a big stir every 20 minutes or so. I actually hated eating the granola back then. I hated the sunflower seeds and would pick them all out before adding milk to my bowl. As you can imagine that made breakfast take a LONG time! 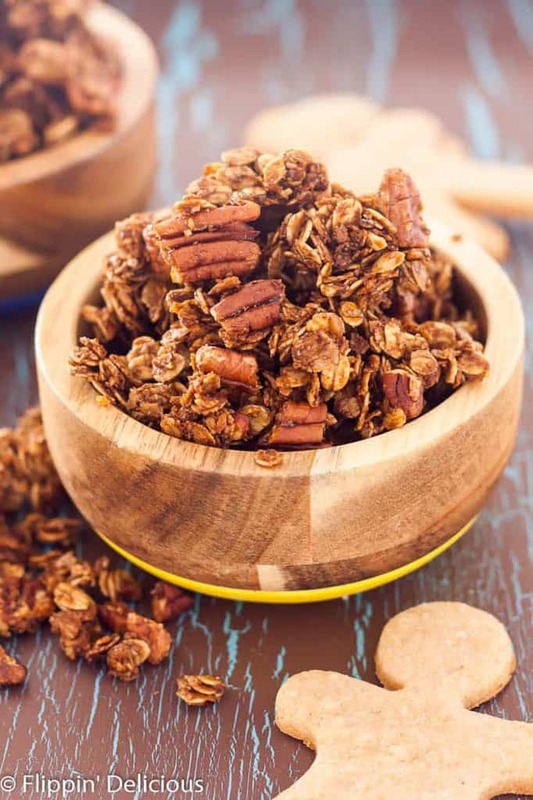 As I grew up I was astounded at the different homemade granola recipes that people create! 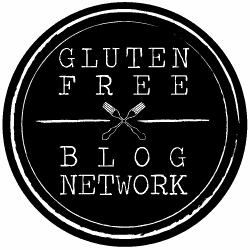 On Flippin’ Delicious I have gluten free oatmeal cookie granola, gluten free salted caramel granola and gluten free pumpkin granola recipes. My granola recipe repetiore pales in comparison to the granola recipe arsenal that Leah from Grain Changer has on her blog. Just a few days ago she shared a recipe for Apple Pie Granola! 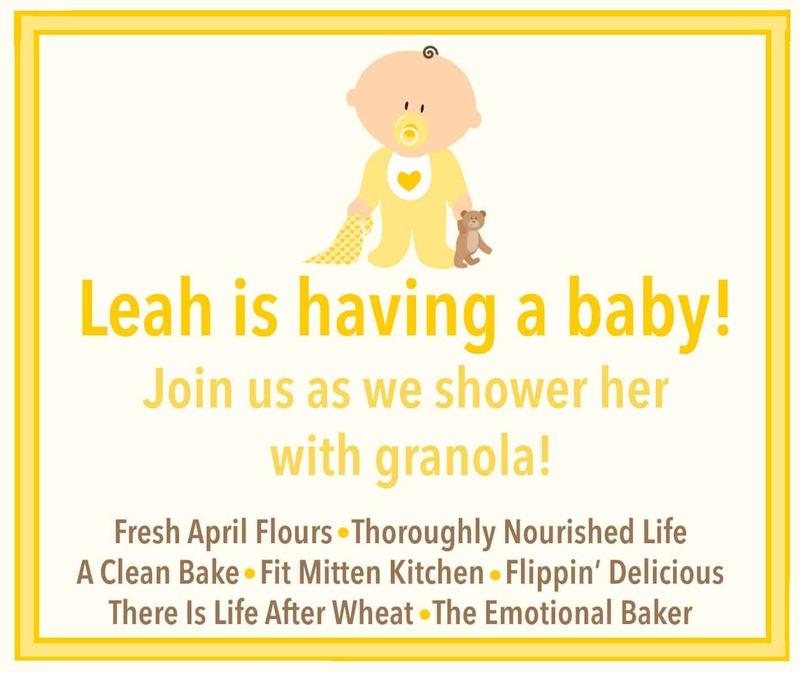 Leah loves granola, which is why some of my friends and I have gathered to shower her and her new baby with granola recipes! I am also a big fan of molasses (When I was a kid I would smother my saturday-morning-pancakes with molasses instead of syrup. I still do on occasion.) If you are a more moderate-molasses-fan you can reduce the molasses to 2 tablespoons and increase the honey by 2 tablespoons. If you are a fan of satisfying clumps in your granola be sure to wait to stir the granola until after it has cooled completely. If you are as big of a gingerbread fan as I am, I think you’ll also like my friend Demeter from Beaming Baker’s recipe for Gingerbread Homemade Oatmeal Breakfast Bars. I love the cranberries she adds! Preheat your oven to 325F. Line a baking sheet with parchment paper or a silicone baking mat. In a large bowl combine the oats, pecans, flax meal(if using) and spices. In a small bowl mix (or large liquid measuring cup) combine the oil, molasses, and honey. Pour the liquid mixture over the oats and stir until evenly coated. Spread evenly over the baking sheet and bake for 20-25 minutes, stirring once at about 15 minutes. Let cool, break into bite sized clumps. Serve with gingerbread men, if you want. 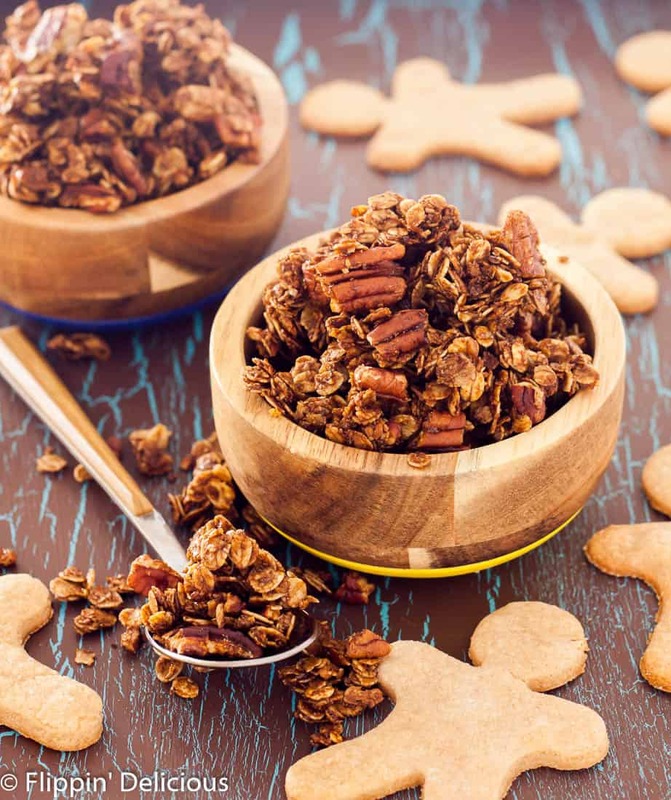 I’ve been dying to make a gingerbread granola! I love this version and can’t wait to try it this holiday season 🙂 So happy we could celebrate Leah together! Thanks Megan! I am happy we could celebrate too. What better way to party than with granola? HOLY COW this looks incredible!!! I’m such a sucker for anything and everything ginger/ gingerbread. I cannot wait to try this, and am sure it will be an absolute lifesaver to have on hand for those lovely 3am feedings 😉 Thank you sooooooo much for joining in on the celebration for our sweet baby boy, Brianna! It really means the world to me!!! Thanks Leah! I am so excited for you and this new chapter in your life. Congrats again! I am going to be eating this for breakfast every day of the holiday season! 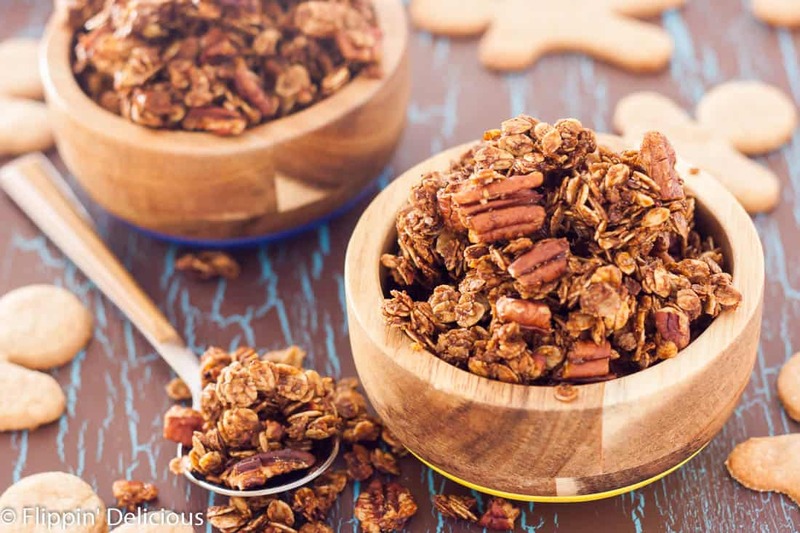 What a delightful granola recipe – and we don’t commonly have molasses over here, but I feel like golden syrup (a really thick sugary syrup made from sugar cane) would be the perfect substitute. I can’t wait to make this! Also, I love the thought of a little Flippin’ Delicious picking all the sunflower seeds out of her breakfast…too funny! I bet golden syrup would work beautifully! I need to get my hands on some. YES to extra ginger!! I love everything about this granola. Thanks for joining in the party, Brianna! Thanks for organizing it Lynn! I had a lot of fun creating a recipe to share. It’s the perfect flavor for this time of year, and I never say no to gingerbread spices! I have to try this!! Thanks Celeste! It gets even better when you add milk. The milk tastes like gingerbread too!